The Michael J. Fox Foundation for Parkinson’s Research (MJFF) has awarded MRC PPU Director Dario Alessi the 2018 MJFF Langston Award for “service and dedication to our shared goals of advancing Parkinson's understanding and therapeutic development”. For further information see here. 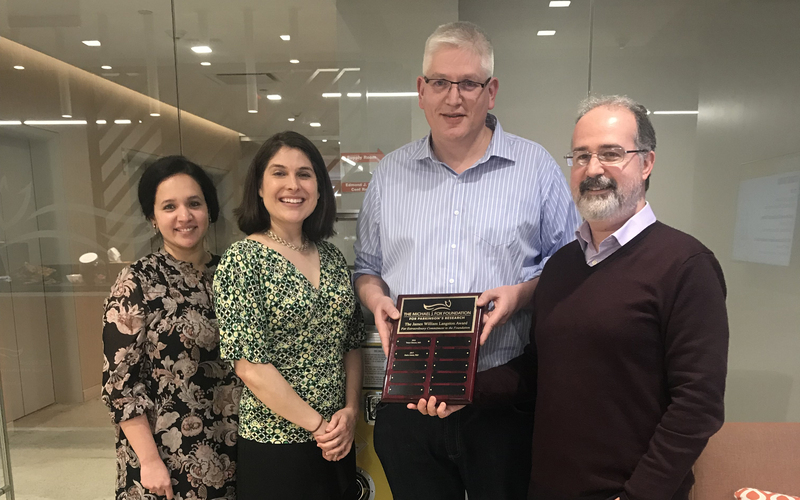 Dario commented: “It is an enormous honour to receive this award named after J. William Langston who has contributed so much to understanding Parkinson’s, who I had the pleasure of meeting at the 2017 Parkinson’s Gordon Research Conference. I would like to thank my hardworking and very talented laboratory members and collaborators as well as the MJFF who have very generously supported our research over the last decade. It is daunting that there is still so much to do and research has taken on added urgency as clinical trials of LRRK2 inhibitors have commenced. I think that a vital ingredient for success going forward will be to forge ever stronger synergistic collaborations between researchers with complementary expertise, clinicians, pharmaceutical companies, funders as well as patient groups. By working together with a common goal, I am optimistic that fantastic and rapid progress can be made towards developing treatments that slow or reverse the progression of Parkinson's, for the first time."